Mila and I hit the road with the girls for the first time in ages for a very pleasant weekend in Plano with Dr. Bezant (aka the good Doctor Pheasant) and his wife Winnifred. We were more than glad to escape Austin's 95-degree daytime highs. At one point I checked Weather.com and saw that it was 90 degrees in Austin and only 66 in Plano. What a difference 200 miles can make! 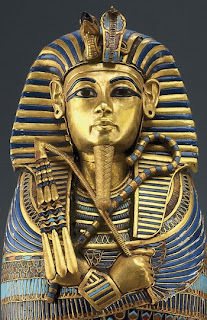 Saturday we went to the King Tut exhibit-- a wonderful treat from our ever-thoughtful hosts. Words cannot do justice to the experience, but I will record two of my impressions here. 1) Remarkably, our youngsters were able to hang with an hour and a half of the exhibit. 2) The craftsmanship evident on some of the artifacts is surprisingly primitive while many of the artifacts show a breath-taking degree of perfection. One must wonder how they were able to create with such precision all those centuries ago. We also visited the Nasher Museum and another museum that houses a permanent collection of Asian art. Perhaps more on those in a later post. Sunday Dr. Bezant and Winifred treated us dinner and a show at Medieval Times. I had taken this to be clearly something for the girls and had prepared myself to tolerate it, but I must confess that I found the experience very enjoyable. Perhaps the most memorable part was our green knight (each color-coded section of the audience is assigned a knight) chose Onni to be his "Queen of Love and Beauty" by presenting her a green scarf on the end of his lance. She was thrilled, as was Davis who got a pink carnation from the knight. This video, shot at the Toronto Medieval Times, will give you a slight feel for what it is like.